We've enjoyed many a tasty dinner at Thai restaurant Spice & Dice, on Joppa Road, so we were excited to learn that they were opening a sister restaurant next door. 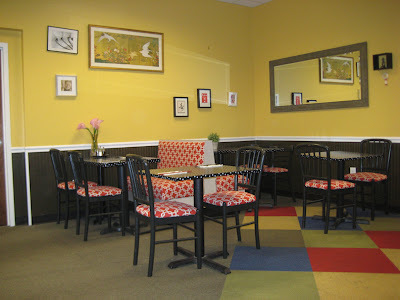 So excited, we visited Noodle Charm on its very first day of operation. Yeah, yeah, we know better than to judge a restaurant by its first day, but we couldn't help ourselves. Noodle Charm is decorated similarly to Spice & Dice, with boldly patterned upholstery and goldenrod walls with randomly-placed and -themed artwork. 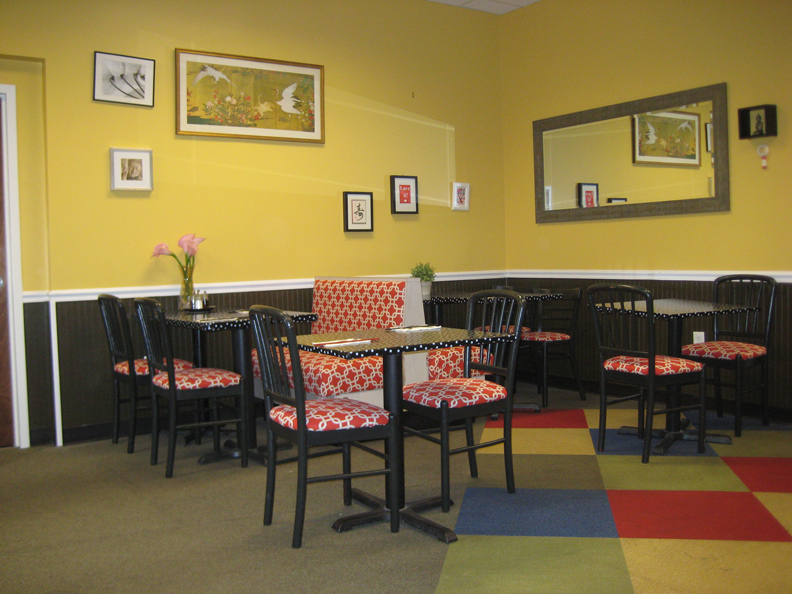 It's a bit smaller - only 12 tables - and the menu is less-expansive as well. 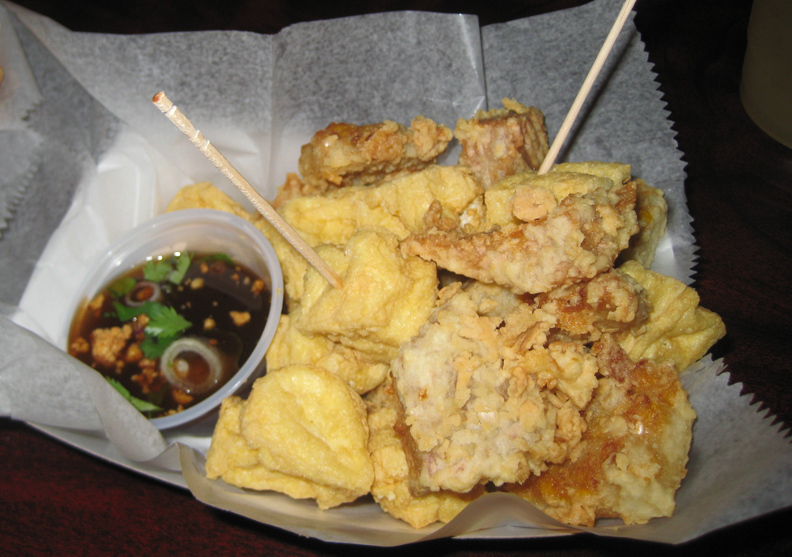 There are only four appetizers, including fried fish balls. Yes, that sounds weird, but they were quite good. 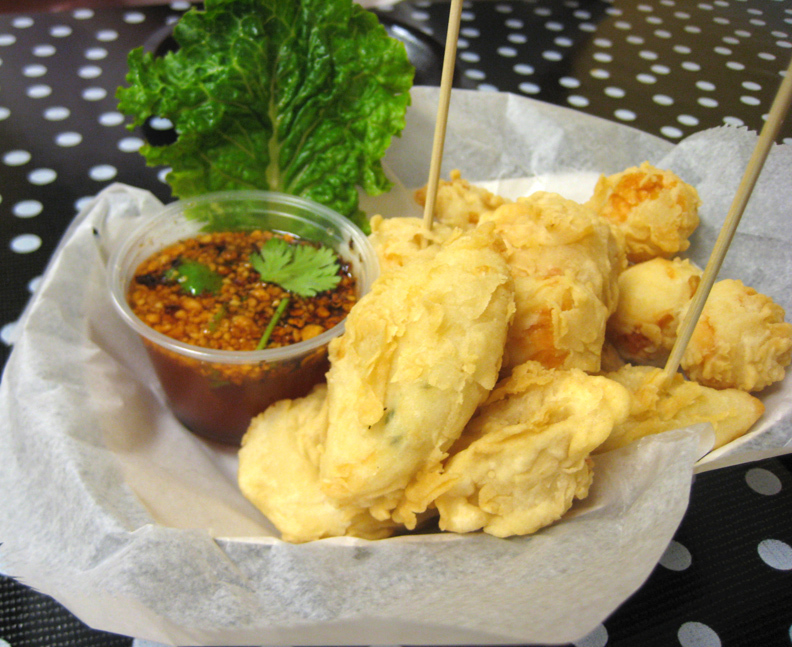 Assorted blobs of fish paste are battered and deep fried and served with a sprightly sweet chile sauce spiked with smoky roasted dry chiles and nubbins of peanut. Crunchy and tender at the same time, the fish balls' mild flavor is really perked up by the sauce. The name might give a clue that the restaurant specializes in noodle dishes, and most things do come with noodles. 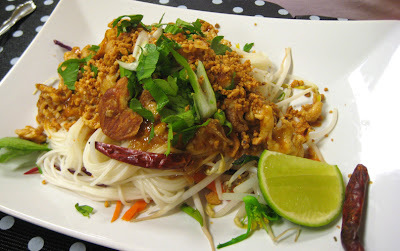 Three dishes are labeled "authentic Thai," and there are seven noodle dishes that can be ordered "your way." 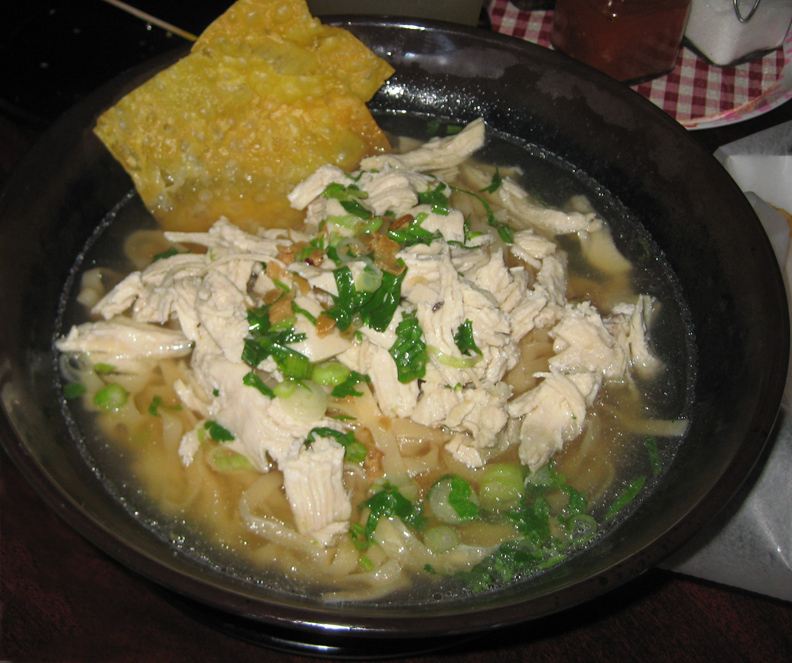 This includes choosing from three kinds of rice noodles, egg noodles, and clear noodles, with or without broth (in broth or broth on the side), and small or large bowl servings. There are four vegetarian dishes, and three rice-based options as well, for those folks with some strange aversion to noodles. On our first trip, Mr Minx opted to try the Bangkok peanut noodles from the "authentic Thai" section. The menu describes the noodles as being soba, which are thin Japanese noodles usually made from buckwheat flour. Here, they are referring to the size of the rice noodles used in the dish, approximately the same thickness as soba. They were topped with a creamy peanut sauce not unlike Thai saté sauce, and garnished with veggies, crispy fried shallots, and cilantro, and pieces of chicken. I went for a rice dish because it sounded intriguing. The 48 hours pork shoulder stew was very similar to Chinese red-braised pork. It had a strong star anise/five spice flavor, and was served over a bed of rice and garnished with a hard-boiled egg and some pickled mustard greens. The dish also came with a saucer of chile garlic vinaigrette to add a punch of heat and acid to the mild dish. 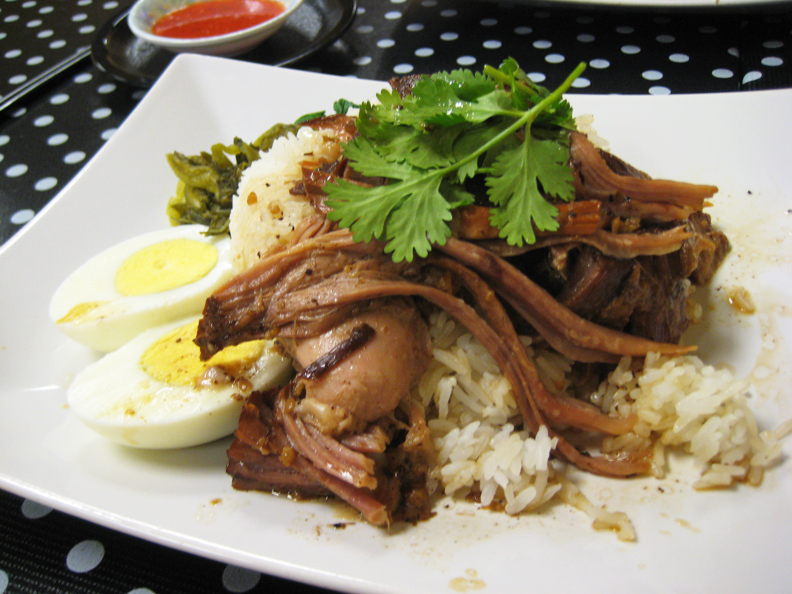 I liked dipping alternating pieces of meat into the vinaigrette and eventually poured some of it on my rice. The flavors of this dish all went together very well. On each table is a set of four jars containing granulated sugar, fish sauce, chile vinegar sauce, and some of those smoky toasted dry chiles. These are for personalizing one's soup broth to their exact liking - a nice touch. We got to utilize these on our next trip to Noodle Charm; this time we waited several weeks before trying it again. 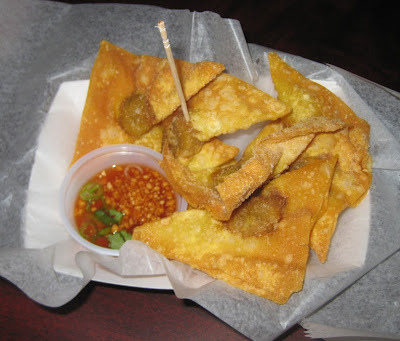 We tried two more of the appetizers, the curried potato fried won tons with a sweet and sour dipping sauce, and the "starter fried," which included tofu, taro, and corn fritter-like corn cakes, all fried of course, with a tamarind dipping sauce. They were both pretty good, especially the potato won tons, which were crisp, greaseless, and rather addictive. The two of us went for "noodles your way." Mr Minx chose the chicken noodle soup with egg noodles. The broth was pale but hearty and very aromatic. His didn't need any help from that condiment dish. 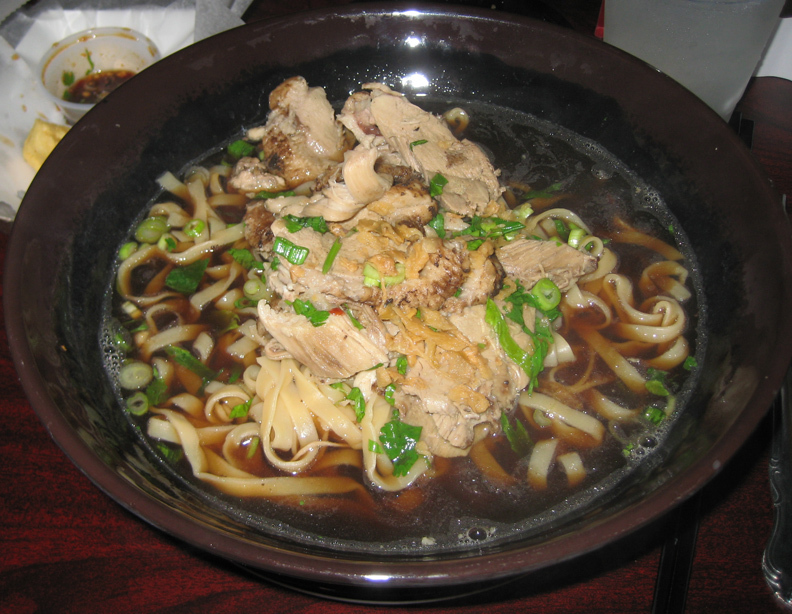 My duck soup had a darker brown broth flavored with star anise, but it was fairly neutral. I added both chiles, a pinch of sugar, and some fish sauce to customize it the way I like it - spicy, a little tart, and nicely salty. Both soups were "big bowl" sized and indeed they were generously portioned, with a nice amount of both meat and noodles. I ended up doggie bagging almost half of mine. 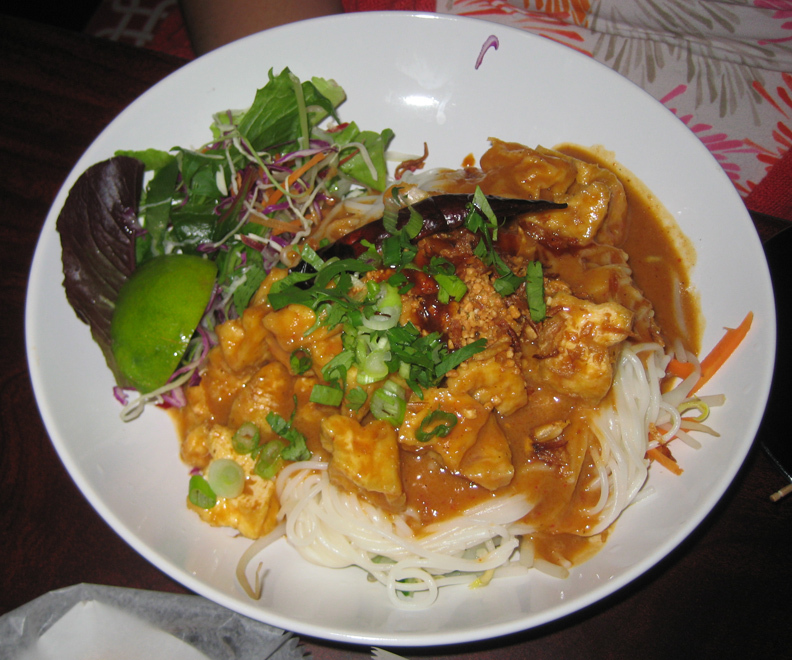 We had a friend accompany us on this trip, and she opted for one of the vegetarian dishes - a tofu version of the peanut noodles that Mr Minx had on our first visit. Hers was served in a bowl and was a much larger portion of food than the dish on the original trip, but the herbal peanut sauce was the same. So far, everything we've tried at Noodle Charm we've liked a lot. Now we need to get more people to dine there - our second visit was on a Saturday night and there was only one other table occupied. I'm hoping that once the Towson University students come back to town, they'll realize they can go to Noodle Charm for a lot of good food for relatively little money - those big bowl noodle soups are only $10, and one can get extra protein for another $2.